To check to see if you have a bad pump, first remove the bottom front panel off the washer by removing the three screws at the bottom of the panel. Once the front is off, you should see the water pump. Then start the washer and let it start washing. Then cancel the cycle. On most frontload washers when you cancel the cycle, the water should pump out. Once you cancel the cycle if the water is not pumping out feel of the pump to see if it is vibrating. If it is you can assume it is getting power. Note that this isn’t always true, the only way to know for sure is to test it with a voltage tester. If the pump is vibrating and water isn’t pumping out check to see if the pump is clogged (read on for more on that) if it is not clogged, replace the pump. Water pumps can be purchased at AppliancePartsPros.com. At times the pump on these washers will clog. To check this, first disconnect power from washer. Then remove all the water out the tub as best as you can. On the water pump you should see a clean out plug for the pump pointing forward. Unscrew the clean out plug. Be ready for right much water even though you removed all the water from the tub. 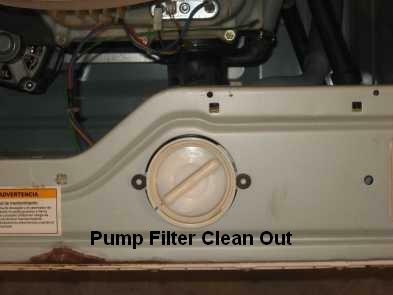 Once the clean out plug is out remove all the obstructions out the pump. Be sure to reach into the pump and get all the trash out. Since front load washer models don’t hold a lot of water I find that if I lean the washer backwards I don’t spill much (if any) water at all therefore there is no need to remove the water before cleaning out the pump in most cases. The main board can cause this problem. If during the first test described on this page, the pump didn’t vibrate it most likely isn’t getting power. Note that this is not always true, the only way to know for sure is to test it with a voltage tester. On most of these frontload washers the pump is connected straight to the main board so if it is not getting power check for a loose connection. If you don’t see a loose connection replace the main board. Main boards can be purchased at AppliancePartsPros.com. I hope this page helps you repair your frontload washer.